Title: The Personal History of David Copperfield. Author: Charles Dickens. Year of publication: 1983. 572 pages. Decorative blue leather boards with gilt lettering to spine and front. Mint condition, original owner. 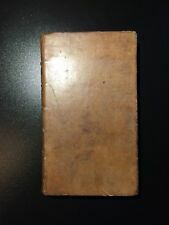 The Harvard Classics: Marlowe, Shakespeare. Publisher:Grolier Enterprises Corp. Format:Hardcover, Burgundy Leather with gold gilt design on boards and silver gilt title and design on spine. Full gold gilt exterior page edges. By Horace Walpole. "The Most Noble Francis Seymour Conway, Earl of Hertford, Viscount Beauchamp, Baron Conway and Killulta, Knight of the Most Noble Order of the Garter, One of the Lords of His Majesty's Bed-Chamber, and Lord-Liutenant of the County of Warwick.". The Great Gatsby, F. Scott Fitzgerald complained (and boasted) to Maxwell Perkins, his editor at Scribner’s: “I don’t know anyone who has used up so much personal experience as I have at 27.”. A specious glamour does, indeed, hang heavily over the early tales and the first three novels. Book is in Fine condition. Book has never been read. Please review all photos as they intrinsically provide the best description of condition and details. I can provide more photos as needed. Please ask any and all questions before purchase and thank you for looking. Shipped with USPS Priority Flat Rate Padded Envelope. TRAGEDIES, by William Shakespeare. Red Leather bound. Collector's Luxury Edition. All in very nice condition. Easton Press The Aeneid by Virgil, part of Easton Press’ series The 100 Greatest Books Ever Written published in 1979. Bound in leather, illustrated, gilt page edges, ribbon marker. POTTR, BEATRIX. The Complete Tales. Easton Press. Leather bound with gold embossed spine and front cover. Satin end papers. Gold page ends. Satin ribbon page marker. See hoots. A bit of scuffing to the gilt and slight waviness to the cover leather (see photos). "The Walnut Door" by John Hersey. Brown Leather Gold Gilt Limited Edition 1977. SIGNED Limited 1st Edition Leather-bound "All God's Children Need Traveling Shoes" by Maya Angelou. Signed by author Maya Angelou on flyleaf page between first free endpaper and half-title page. Boards are clean and square, with one very small indentation/scratch to front cover (pictured, see photos for detail). This is a leather bound limited edition of James Fenmore Cooper’s classic work: The Last of the Mohicans. There is some wear to this book including a soiled area on lower spine corner and discoloration to edges of silk moire endpapers. Some scratches on gold gilt page edges. This volume is in acceptable or better condition. Illustrations are by famous artist, N.C. Wyeth. Red leather, 6 1/4" by 4 1/2" app. English, illustrated. 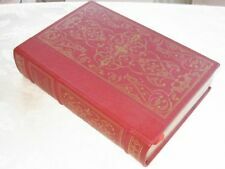 Franklin Library-Ivan Turgenev- First Love and 7 Other Tales Full Leather Ltd. Tight, crisp and clean book. Full leather binding. Silk moire endpapers. Gold gilt page edges. Minor usage wear. Small scratch to the leather on rear board edge. Edition: Undated, but quite old, M. A. Donohue & Co. By: John Bunyan. Pilgrim's Progress. Almost unopened book; binding is tight. Some light surface scratches on gold gilt page edges. As is-some soiling on front board. An Enquiry Into the Nature of Certain Nineteenth Century Pamphlets, A Sequel to an Enquiry: The Forgeries of Buxton Forman & Wise, & Two Poems (3 vols). London: Scolar Press, 1983. SECOND EDITION LIMITED TO 80 SETS. Easton Press Jude The Obscure by Thomas Hardy, part of Easton Press’ series The 100 Greatest Books Ever Written. Bound in leather, illustrated, gilt page edges, ribbon marker. DEFOE, DANIEL, Moll Flanders. Limited Edition. Illustrated by David Palladini. Leather bound with gold embossed spine and covers. Satin end papers. Gold page ends. Satin ribbon page marker. Tally Hall Press Classics 1996 1st Print full number line 10-1, Red Leather HardCover Binding with Gilt Art Scroll work with Borders and lettering of cover and spine, sewn binding with a sewn in silk book Mark, All Gilt edges, art work on end papers, acid free text, Size 9-1/4" Tall x 6-3/8" x 1-1/2" Thick, Type face modeled after Nicolas Benson's classic Roman font of 1470, 455 pages. Excellent near mint condition of Easton Press 1980 edition. Slight indentation on top right side of cover front & back. Has 22K gold embossed pages, archival quality paper and a gold silk bookmark ribbon. This book is titled "The Last Angry Man", authored by Gerald Green. It was published in 1978. There is no owner's plate attached, nor any owner's mark of any kind. Covers are nearly perfect, with only a few slight blemishes noticeable upon close inspection. Bound in leather, illustrated, gilt page edges, ribbon marker. Love's Labour's Lost by William Shakespeare. The Easton Press. MOLLY AND THE SLOW TEETH. special antique look old style brown leather binding by Weitz. Raised in Chestertown, Maryland, she received a degree in early childhood education from Hood College. bunch of old Stuff for lots of great books and more. Easton Press Gulliver's Travels by Jonathan Swift, part of Easton Press’ series The 100 Greatest Books Ever Written. Bound in leather, illustrated, gilt page edges, ribbon marker. Polio by David Oshinsky. From the Easton Press Pulitzer Prize Collection. 2006 Pulitzer Prize Winners. This set is published by Easton Press and would be a beautiful addition to your Easton Press collection. Hans Brinker or The Silver Skates. by Mary Mapes Dodge. The front and back covers are both in near perfect condition and the gilded page edges show minor wear (see pictures). There is slight residue inside front cover.